This plants shows a range of nice subtle ocre orange tones. 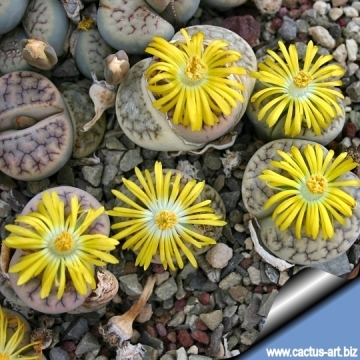 Description: Lithops gracilidelineata ssp. 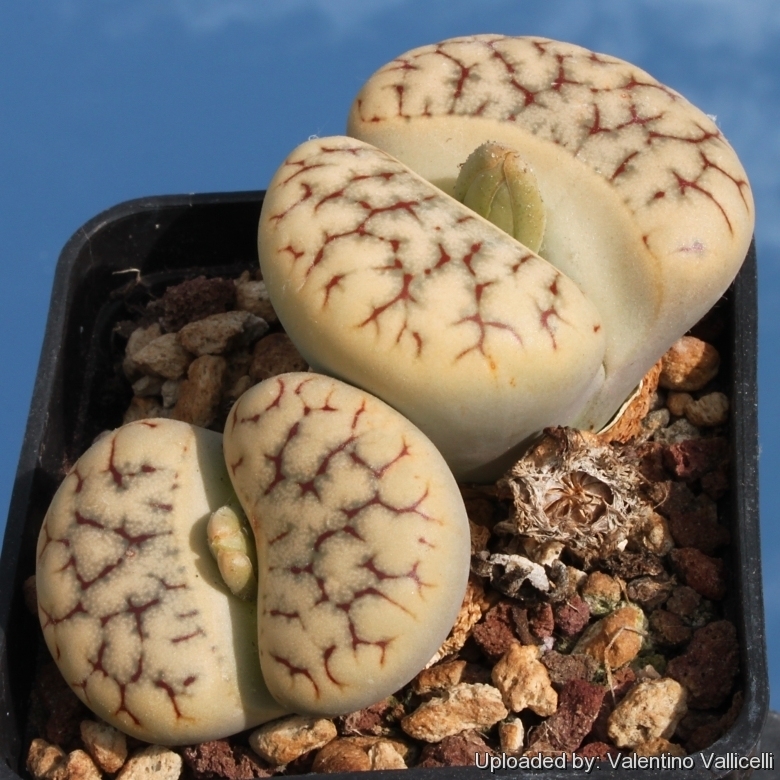 brandbergensis is a distinct subspecies of Lithops gracilidelineata recognizable for the nice ochre orange tones. The network of dark brownish-red lines, which is the prominent feature of the top surface shows a great deal of variation, not only in the way it anastomises but also in its colouration. Habit: It rarely forms more than a single head or, if branched, forms only few bodies in a clump. 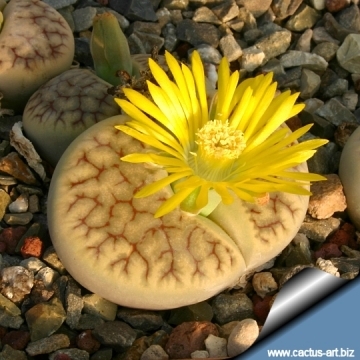 It is variable, but conforms to the typical Lithops morphology: two thick, fleshy windowed leaves separated by a crack from which a yellow flower appears. The windowed part allows light into the inner portion of the leaf where the process of photosynthesis is carried out. Old leaves persist for one year usually, often for two years. Flowers yellow 20-45 mm in diameter. Sepals 8 mm long, 2-3 mm broad. Fruits: 6(-7)-chambered, profile rotund to boat-shaped, top convex to peaked, faces broadly elliptic. Lithops gracilidelineata Dinter: Faces shows various shades of opaque greyish white with beige to reddish brown fine grey or brown grooves. Flowers yellow. Lithops gracilidelineata subs. brandbergensis (de Boer) D.T.Cole: Top opaque beige with subtle orange tones and reddish brown branching lines. Flowers yellow. 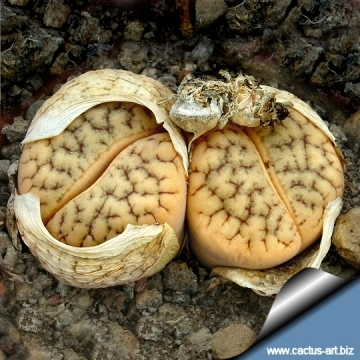 Lithops gracilidelineata subs. brandbergensis C383 TL: Brandberg, Namibia (de Boer) D.T.Cole: This plants shows a range of nice subtle ocre orange tones. 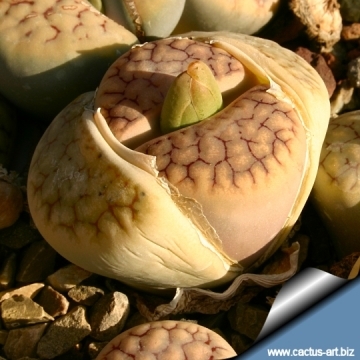 Lithops gracilidelineata subs. brandbergensis C394 Brandberg, Namibia (de Boer) D.T.Cole: Plant with ocre orange tones, but redder than C 383. Lithops gracilidelineata C261 TL: 75 km NW of Usakos, Namibia: red lines on grey body. Lithops gracilidelineata C262 30 km NW of Usakos, Namibia: red lines on grey body. Lithops gracilidelineata C309 45 km W of Usakos, Namibia: Orange-brown to bone white top, could contain a few Café au Lait. 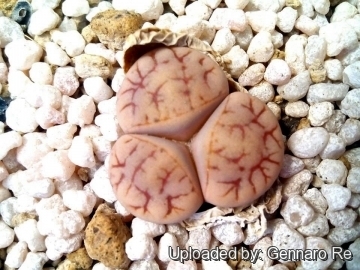 Lithops gracilidelineata C373 (syn. streyi) TL: 25 km SE of Fransfontein, Namibia: white finely humped bodies. Lithops gracilidelineata C374 100 km S of Usakos, Namibia: fine brown grooves, distinctive. Lithops gracilidelineata C385A 65 km ENE of Swakopmund, Namibia cv. Ernst’s Witkop D.T.Cole: Flowers white (instead of yellow), but the plants indistinguishable from cv. Fritz's White Lady. Lithops gracilidelineata var. waldroniae de Boer: Faces creamy-white or greysh-white finely knobbled, flowers yellow. Lithops gracilidelineata var. waldroniae C189A TL: 60 km SE of Swakopmund, Namibia. cv. Fritz's White Lady D.T.Cole: Flowers white (instead of yellow), but the plants otherwise indistinguishable from var. waldroniae and therefore identifiable only when in flower. 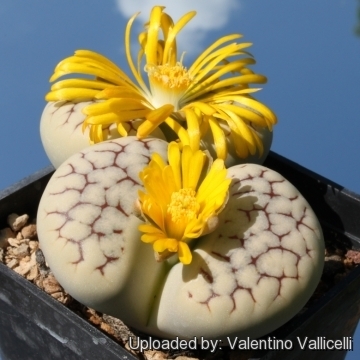 Lithops gracilidelineata var. waldroniae C189 TL: 60 km SE of Swakopmund, Namibia H.W. de Boer: Plants with clear pastel body and knobbed top with fine brown lines. 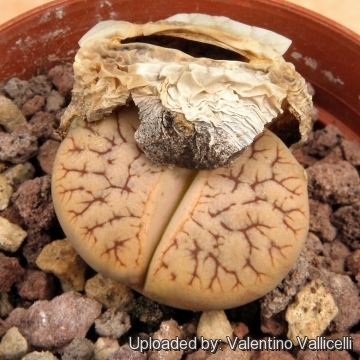 Lithops gracilidelineata var. waldroniae C243 70 km E of Swakopmund, Namibia: larger smooth body. 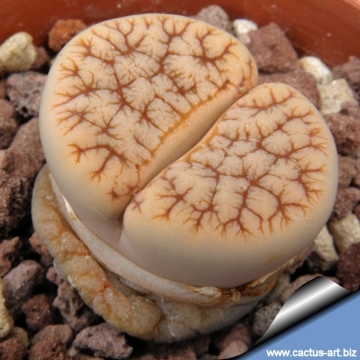 Lithops gracilidelineata cv. Café au Lait: (a.k.a. Milk & Coffee) pastel colous with fine dendritic orangish decorations. 16) “Lithops gracilidelineata Dtr.” in Graessner, Südwestafrikanische Lithopsarten, Perleberg, 1928.